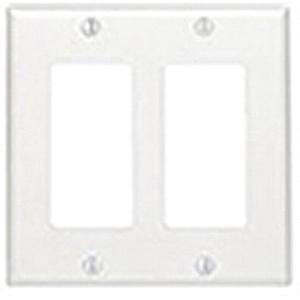 Mulberry Endura™ Standard size 2-Gang square GFI block wallplate in white color, has thermoplastic construction. It measures 4.562-Inch x 4.5-Inch. Wallplate has two block duplex/GFI receptacle configuration. It is ideal for hospitals, schools and other institutional facilities. Flexible design of this wallplate conveniently fits over uneven wall surfaces. It resists grease, oils and solvents. This wallplate has vertical orientation. Wallplate is UL listed, CSA certified and meets NEC standards.